Perhaps, deportation to you and your relatives is not threatened, but, as is known, do not renounce money and prison. What to expect from the new deportation policy of the administration of President Trump, what to do to those who have already found themselves in the deportation process. 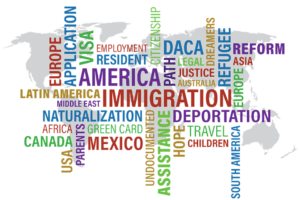 Immigration law is subject to uniform federal laws. Lawyers are urged to prepare clients for the worst and not to give false hopes, as the courts now have much less initiative to show indulgence. Judges warn: it was a time when a person threatened with deportation could count on closing the case or deferring deportation on humanitarian grounds. This is important for those who are already in the deportation process. The deportation process will become shorter and more intense. The time between court sessions will be reduced, delays at the request of the immigrant will be granted only in exceptional cases. Decisions on deportation cases will come sooner than before. Often at the last hearing, the judge says that the decision will come to the person by mail. So, if earlier people could wait for months (and for some cases in loaded ships and more than a year), in the near future this process will accelerate. But this is true mainly for negative decisions on the case: if the court decided to refuse the applicant, the decision will be issued quickly. Accordingly, if there is no written response from the court for a long time, this can be interpreted as a sign of hope for a favorable outcome. Judges are urged to submit supporting documents in advance, not on the eve of the final hearing. Since deportation cases now require more thorough documentation and, accordingly, the amount of accompanying documents increases, out of respect for the court it is necessary to file accompanying documents as early as possible in order to give all parties to the process an opportunity to familiarize themselves with them. The great efforts of President Trump’s administration are aimed at identifying cases of immigration fraud, including the participation (conscious or negligent) of lawyers in providing knowingly unreliable documents. If the court has reasonable suspicions that the lawyer tried to manipulate the system in the interests of the client, using not completely clean methods of work, the court can initiate disciplinary measures. All documents submitted to the court must be repeatedly checked and structured so as not to give the slightest opportunity to doubt their reliability, because now much more often than before, doubt can be interpreted not in the applicant’s favor.